I suspect I am not alone in being surprised, when we have researched for years already, that breakthroughs in our genealogical research bring us exciting new family information, and if we are really lucky, new cousins! Especially, when it is not really due to our own work, but a gift of someone else’s hard work! That happened to me in just the last three weeks when a woman named Karen Migliori got in touch with me on ancestry to tell me that my DNA matched her husband’s Italian line of ancestors whose DNA and family tree she administered. I was so excited, because I knew very little about the Italian line of my mother’s family except for those who had lived in Richmond, Virginia, USA where I was born and raised. My DNA results said I was 5% Italian, and I was so happy to learn that. My mother often talked of her Italian grandmother, Mary Catherine Botto, who married her grandfather James Henry Kearse, who was Irish. Even though I am 15% Irish, I have always felt an affinity and affection for the Italian passions I inherited. Together, Lewis and Catharina Botto had two children, James Lewis Botto, 1857-1923, and Mary Catherine Botto, 1858-1906. Mary Catherine as I said before, married James H. Kearse and they were my great grandparents, making Lewis and Catherine Revaro Botto my second great grandparents.. On the 1860 census, Lewis appears as a confectioner in Richmond, VA. and is living with his wife and two children. However, I have not yet been able to discover for sure what happened to Lewis Botto. I do not know if he died in the Civil War, if he and Catharine got divorced, or just why he disappeared, but I do know that in 1866, Catharine married her second husband, Nicholas Raffo, 1837-1873, also born in Italy. Together they had one son, John Francis Raffo, 1867-1951. On the marriage record of Catharine Revaro Botto to Nicholas Raffo, I finally learned that Catharine’s father’s name was Anton Revaro, sometimes seen as Andrew Rivers. At last, I knew the names of my third great grandfathers. Catharine Revaro Botto Raffo had three children altogether, two sons and one daughter. James Lewis Botto married Margaret Slattery and had six children. Catharine’s daughter Mary Catherine Botto married James Kearse and had four children, including a set of twin girls and two boys. Catherine Botto Raffo’s son John Francis Raffo , 1867-1951, married Mary Margaret “Minnie” Finnegan and had eight children! Blessed to have three children, Catharine had 18 grandchildren! Lewis Botto had ten grandchildren. What a legacy! James Lewis Botto owned and operated a nightclub in Richmond called the St. Helena. Mary Catherine B. Kearse was a business woman like her mother, collecting rents from rental property they owned, and she was also a jeweler, the co-owner of a well known jewelry store in Richmond. John Francis Raffo was a firefighter who became the Chief of the City of Richmond Fire Department with a career that spanned fifty years! Teachers, Police Officers, Firefighters, and a Catholic Priest. the caretakers of Richmond, Virginia, USA were some of my own family! Previously, I had met, through ancestry, some of my living Raffo cousins, in California, Virginia, and right here in North Carolina, only about an hour away! That was about all I knew until two weeks ago. Even though I had met and become friends with another Botto cousin through our own DNA match- Eric Dimiceli from New York, he only knew that he had a second great grandmother named Catarina Botto, 1837-1913, who was born in San Colombano, Certenoli, GE, Italy also! She had married a Carlo Molinari. We knew they were related, but could not determine how for lack of records. As promised here is the information found in the records of the church in S. Colombano Certenoli. -Angela Maria born October 16, 1827, She married Bartolomeo Daveggio on February 5 1845 This is my second great grandmother!!! !-Giacomo Luigi was born July 23, 1831. No record of marriage in S. Colombano. -Maria Teresa was born October 13. 1834. She married Antonio Raggio May 2, 1859. -Caterina was born April 17, 1837. She married a Carlo Molinari (no date). She died July 25, 1913. -Rosa was born October 19, 1841. She died October 9, 1842. How exciting to discover that our second great grandparents were siblings! Eric descends from Catherina Botto; Ray and Tom descend from her sister Angela Maria Botto; and I descend from their brother Giacomo Luigi! Giacomo Luigi, I was so happy I could hardly stop saying that name. I had only known him as Lewis who married Caterina Revaro, and had a son named James Lewis Botto and daughter Mary Catherine Botto! Giacomo Luigi translates to James Lewis also, the name of his son! Live and learn! It was so much fun! I immediately sent out an email to all of my Kearse/Botto first and second cousins to introduce Ray and Eric, and give them the information! I also learned the names of two of my fourth great grandparents! Lorenzo’s father was Bernardo Botto, and Maria Rosa Costa’s father was Luigi Costa! There it was, Luigi, a family name. Since Ray, Eric, Tom, and I are fourth cousins, we should share a third great grandparent, and indeed we are all descendants of our third great grandparents, Lorenzo and Maria Rosa Costa Botto! Ray and I share 13.1 centimorgans of DNA across one DNA segment! Eric and I share 12.0 cM’s of DNA over one DNA segment and Tom and I share 22.5 cM’s over 2 DNA segments. Below are our relationship charts, detailing our kinship. What a blessing from DNA and genealogical research to find three new cousins from California, to New York to North Carolina, USA–from Italy with love! 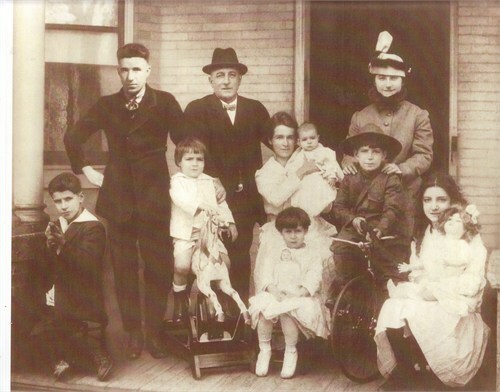 Categories: Botto/Raffo/Revarro family posts, Kearse/Kerse family posts | Tags: Botto, DNA and genealogical Research, Eric Dimiceli, Italian heritage, Raffo, Raymond Malispina, Revaro, Thomas and Karen Migliori | Permalink. “Mirror, Mirror, on the wall…tell me your stories, tell them all!” (by Helen Y. Holshouser with prompting by sister Anne) This beautiful mirror hangs in my sister’s home today in 2014. It has been in our family for almost 200 years, maybe more. It belonged to my second great-grandmother, Catherina Revaro, born about 1825. 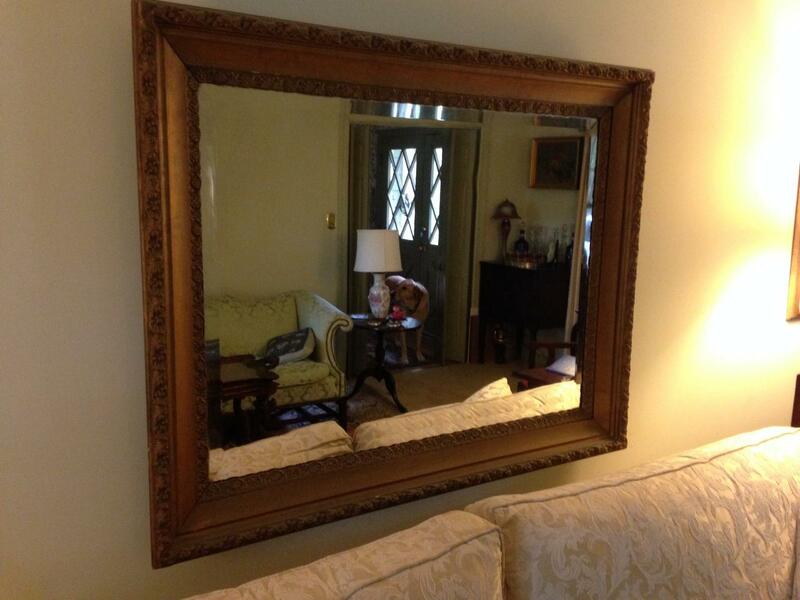 I do not know where Catherina got the mirror, or how long it might have been in her family, but we are told it is a family piece from Genoa, Italy where she was born. We have an oral history story passed down in our family about Catharina. Mother always said that Catherina, called Catherine in our family, was the daughter of a wealthy family in Genoa, Italy. They had a large department store there and in Rome perhaps. Catharina was a student in a private girls school, located in a convent. However, she had fallen in love with a boy named Luigi Botto! They supposedly left Italy together, coming ultimately to Richmond, Virginia where they married and had two children, James Lewis Botto 1857-1923, and Mary Catherine Botto, 1858- 1906, who married James Kerse and became my great-grandmother. 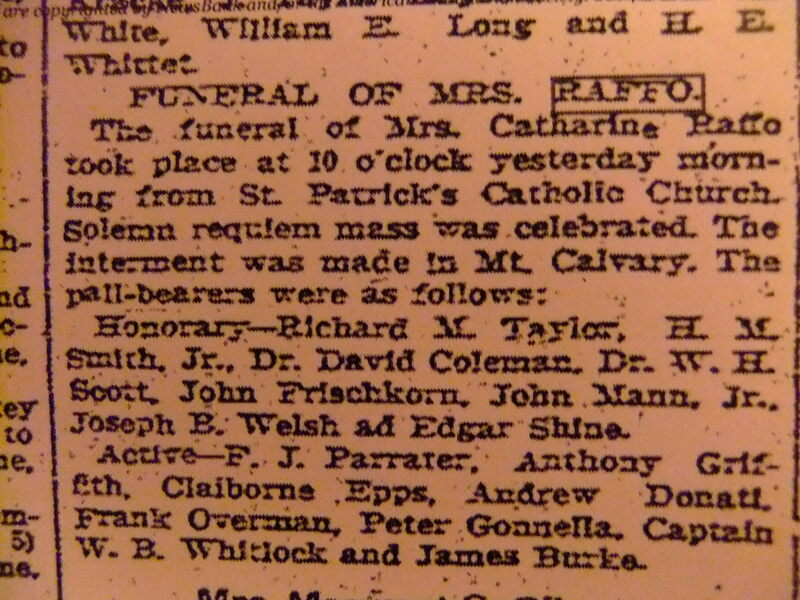 Catherine married a second time to Nicholas Raffo in 1866, and had another son named John Francis Raffo, 1867-1951. I have always loved all things Italian, perhaps this line of relatives explains that trait or propensity! In fact, it was pursuit of knowledge of this, my Italian heritage which originally got me started in genealogical research! I quickly learned that they were not easy to research, because a lot of the records were written in Italian and/or Latin! However, after many years of working on this effort, and help from other researchers, I have put together this picture of the Italian branch of our family. I decided the family above could not be my Bottos, when I followed them to Kentucky, then when I actually met on ancestry some of their descendants, living in Boston, Massachusetts, I learned this was their family, not mine! Back to the drawing board, I found many Louis Bottos, and few Catherines. 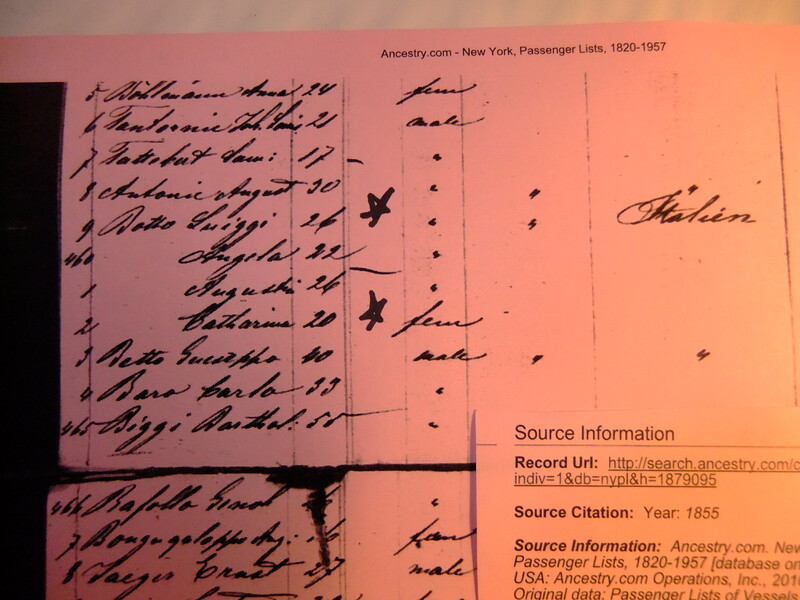 But finally, I found this document, and I believe it fits better than most, the ship’s passenger list includes both a Luigi Botto age 26 and a Catharine Botto age 20, on board the ship Switzerland, arriving in 1855! That would be perfect timing for them to get to Richmond,Virginia and have two children in 1857 and 1858! However, if the marriage certificate below is correct for them, they should have been in Richmond by 1853! 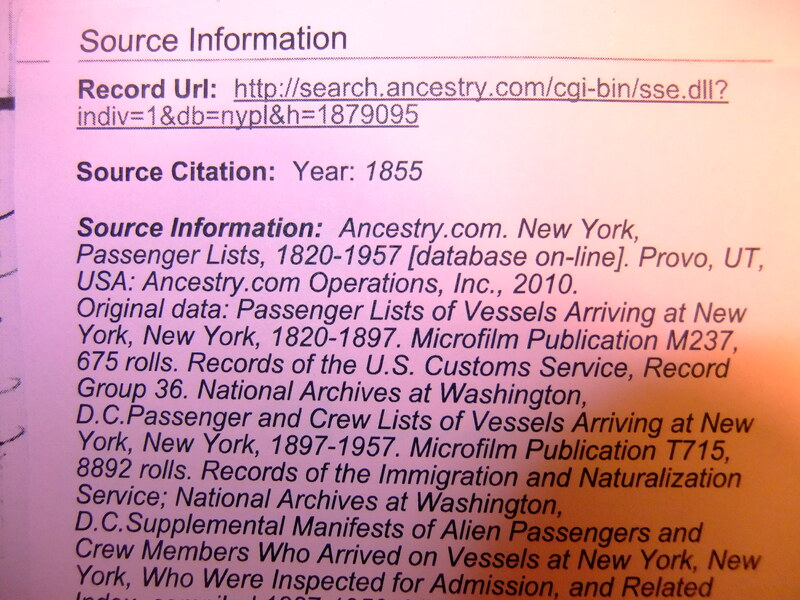 Oh dear, this is the way genealogical research works, just search, and search, and eliminate and search some more! Keeping this, I went on to research more and see what I could find. I knew that Catherine had married a second time because she had a son named John Francis Raffo that I could see on the censuses. So I searched for both Raffo and Botto information. Finally i found a marriage certificate on ancestry.com for Nicholas Raffo and Catharine Botto also Catharine Revaro, father Anton Revaro! There was her maiden name! Alleluia! It wasn’t long before I decided to take my DNA through ancestry.com, which showed I was 5% Italian in my ethnic makeup. Cool! That combined with knowing Catherine’s maiden name, helped me learn much more about my family, including meeting cousins and other people researching them! One of those folks was a researcher who spoke Italian and Latin and researched original records even from the Vatican! I was very impressed! 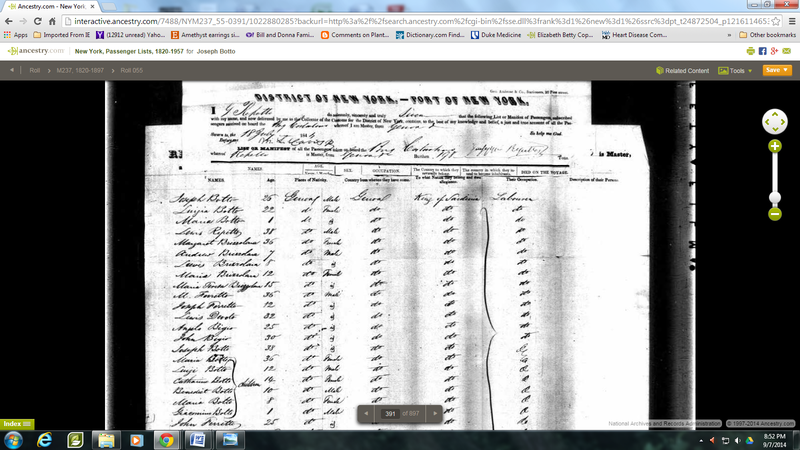 Diane ended up finding the birth certificate of my great, great grandparents, Louis Botto and Catherine Revaro. On the certificate you will notice that her name had been anglicized to Rivers, and his was written as Botte, typo or a name change, I am not sure. I already had the date of the Raffo marriage from censuses, and the date on the Botte marriage certificate agrees. However, the Botto name appears on censuses and many other records. the ages and dates of birth don’t match for Catherine, but this doesn’t overly worry me as I find this often the case. This gave me his parents names as well! My Italian roots were growing! So, we have Catherine Revaro coming to Virginia from Italy and marrying Lewis Botto in 1853, naming their children James Lewis and Mary Catherine Botto. In 1866, Catherine married for the second time. I have not been able to ascertain what happened to her first husband, however, no death notice, find-a-grave document, no military record that I can find! There are other Louis Bottos in the United States as well. In the Richmond City telephone directory of 1876, Catherine is listed as Catherine Botto, widow of Louis Botto! In 1876, she was a widow all right, but the widow of Nicholas Raffo who had died in 1873! Catherine ‘s first husband must have died, besides being listed as a widow in the phone directory, when Catherine herself dies in 1903, we can find an obituary in the Richmond Times Dispatch newspaper that states that a “solemn requiem mass” was said at her funeral at St. Patrick’s Catholic Church, the church where the family attended for years. She would not have been thus honored if she had divorced. The Catholic Church would not have allowed it. Mrs. Catharine Raffo, mother of Mr. James L. Botto and Mr. John F. Raffo, of the fire department, and Mrs. Mary C. Kerse, wife of Sergeant James H. Kerse, of the First Police Station, died Saturday morning. Her funeral will take place Monday morning at 10 o’clock from St. Patrick’s church. The interment will be in Mt. Calvary. Raffo died April 25, 1903, at the residence of her son-in-law, James H. Kerse. 2612 East Grace St. The funeral will take place Monday morning, April 27th, at 10 o’clock, from St. Patrick’s Church with a requiem mass. Friends invited to attend Interment Mt. Calvary. Washington and New York papers please copy. who died five years ago. seated ’round the great white throne. “Loving remembrance of my devoted Grandmother”! Those words say a lot about Catherine Botto Raffo! How interesting. I’ve been thinking of her children. James Lewis was born in 1857, his sister Mary Catherine in 1858, they were only 9 and 8 years old when their mother remarried. Had they known their Dad at all? Then their stepfather dies when they are 15 and 16! After her marriage in 1866 to her second husband Nicholas Raffo, her son John Francis Raffo is born in 1867. His father dies in 1873–at six, he probably only had hazy memories of his father. Those are rough events in young lives. The Civil War was waged during their childhoods, Richmond was the capital of the Confederacy! What must they have seen and heard! Yet, we know that John Francis Raffo grew up to become a firefighter, then chief of the Richmond City Fire Department, spanning a fifty year career with them! One of John Francis’ great, great-grandchildren sent this picture to me, which I treasure. Yes, his descendants are alive and well and going strong. I am regularly in touch with one of them on facebook, and another I have met in person. (more of that at a later time) Among them are soldiers, a priest, and many other s including genealogists. This is a line of descendants any mother would be so proud to call her own! Catherine’s daughter Mary Catherine Botto married James Kerse and became the mother of my grandfather Thomas Philip Kerse. She had four children in fact, but two of them died young, Andrew Leo in infancy and Kate, the twin of Marie, died at age 17 of a burst appendix. In fact, because Kate died of a burst appendix, when her brother Thomas Philip came down with appendicitis in his early twenties, the family hired a private duty nurse to take care of him. That nurse turned out to be Katherine Steptoe Kerse, who married Thomas Philip and became my cherished grandmother! They went on to have seven children, twelve grandchildren, 18 great-grandchildren, and so far, 4 great- great- grandchildren! We have several college professors, lawyers, building contractors, teachers, and firefighters! Catherine can be proud of this line of her daughter’s. Now James Lewis Botto was very different from his sister and half-brother it seems. He was a local politician, and owned a night club in downtown Richmond called St. Helena’s. He was married with six children, four sons and two daughters. Both daughters married men of excellent standing from great families in Richmond. The father and two of his sons went to jail. The father, James Lewis, for only 3 months for bringing illegal liquor into the state to sell at his club during prohibition! A rum runner in the family! The other son, William Joseph Botto, a policeman forced to resign, went to jail only 30 days on this same charge, but then he was charged with domestic violence in 1914, assaulting his wife! He left his wife and disappeared. She had him declared dead after several years! In 1930, he disclosed who he truly was, just before he actually died in a hospital in New York! It is hard for me to believe this happened in my own family! Another son, John Francis Botto went to the penitentiary for 15 years for attacking a 13-year-old girl! Good gracious–what happened in this line of family?! As bad as this seems, we must remember that four of the six children in this family turned out to be excellent citizens, it is not right to judge them poorly on the merits of their father and two brothers! However, it is curious, just how is it that some siblings make such bad choices with their Dad, and most make great choices. The heirs of this family were all female, so the Botto name from James Lewis’s line died out, there are descendants, just not with the Botto name. Since he was the only male heir of Luigi Botto, his line of Bottos did not continue. I knew we had Italian ancestors, my mother talked about it a lot. But I did not know they were alive and that I could have gotten to know them while growing up! What a shame to miss knowing family until you are in your sixties! I have a clue as to why this might have happened . Catherine Botto Raffo died in 1903, having outlived both husbands by many years. We were told that Catherine was an excellent money manager, and indeed, when she died several things were published in the Richmond Times Dispatch giving us a glimpse into her business acumen. As a successful business woman, she had amassed a fair amount of property. I don’t know how she left it, or if she even had a will, but according to the paper, in 1907, John Francis Raffo sued his half-brother James Lewis Botto et al (did that include my great-grandmother Mary Catherine Botto Kerse? Probably.) I don’t think that is all that unusual however, heirs who inherit equally–one or more want to keep the property, others want their money for their share perhaps. Whatever the situation, John Francis Raffo sued and the court ordered that the lots in downtown Richmond be sold, and the money divided. I imagine that caused great division within the family. Perhaps the Raffos and Bottos no longer spoke, how sad. What would Catherine think? Would she focus on the positive, the many descendants who’ve done well, been responsible and active citizens. Or would she just be devastated about her one son’s family and the two of his sons who got in so much trouble! What an interesting family, wish I knew more, perhaps I will learn more one day. Finding interesting stories like these, and meeting living cousins, discovering lines of relatives you didn’t even know existed, that’s what makes genealogical research so exciting! 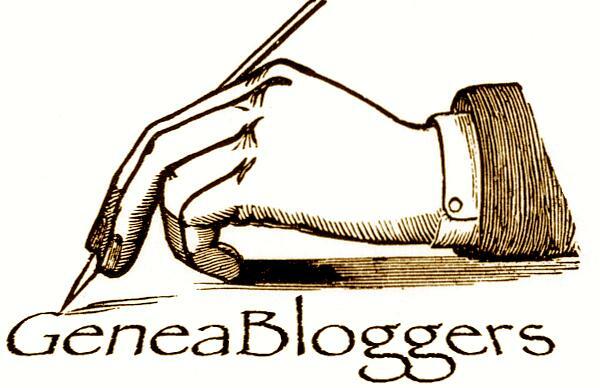 Categories: 52 ancestors' stories in 52 weeks, Botto/Raffo/Revarro family posts, Genealogy | Tags: 52 Ancestors in 52 Weeks, Botto, Catherine Revaro, Genealogy, Genoa, Italian heritage, Italy, Raffo, Revaro, Richmond, Virginia | Permalink.